The last few months have been kind to Fragrant Moments. First there was Complex magazine, and now Men’s Health. When its Fashion and Grooming Editor, Brian Boye, gave me a call and said he wanted my contribution on this story he was working on for the November issue, I was awe-struck. I’ve known him for years and I admire his work and I read the magazine, regularly. And while I’ve worked with him on the yearly Grooming Awards, it still felt special. I’m passionate about fragrances and opening my readers eyes to the many options out there. So its nice when I’m asked to contribute elsewhere. Anyhow, I hope you guys learn something but the bottom line is you’ve got to get in the stores and sample. Thanks for the opportunity Brian. Let’s do it again. 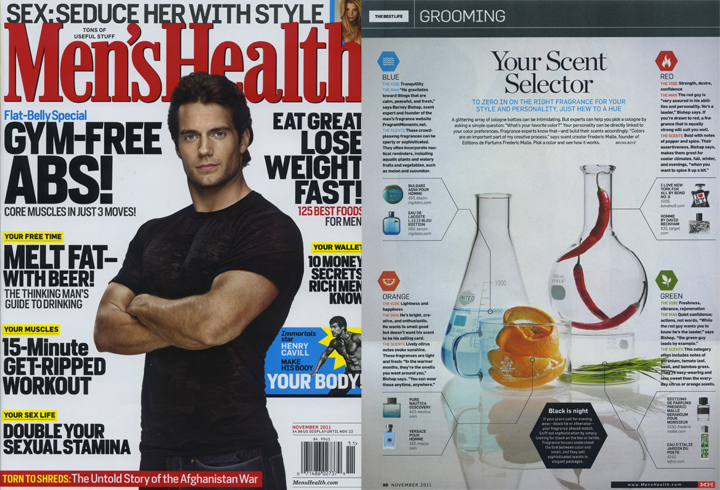 This entry was posted in Good Read and tagged Brian Boye, Fall Fragrances, Men's Fragrances, Men's Health Magazine. Bookmark the permalink.